EDN is a group of native people descended from the pre-colonial inhabitants of Pennsylvania who resisted being forced out or survived and returned. EDN’s mission, as stated in its Summer 2010 newsletter, is “to gather the scattered people of the Delaware Tribes, restore traditional culture through researching history, heritage and cultural contributions, and promote cultural awareness through education.” On April 1, 2010, members of EDN’s leadership signed a non-surface impact lease with Chesapeake, allowing the company to drill horizontally beneath their property for natural gas. By the terms of the lease, Chesapeake is not permitted to drill wells, install pipeline for water withdrawal, or build roads on EDN’s land. Chesapeake offered EDN $5,750 for the right to drill beneath each of its fifteen acres. In addition to Chesapeake’s payment of over $86,000 for initial drilling rights, EDN will receive 20% of the proceeds from natural gas drained from its property over the term of the five-year lease, with the possibility of renewal. Discussion of EDN’s possible deal began with talk among EDN members about their multiple smaller sales of gas-drlling rights on private plots of land, according to Eliot. 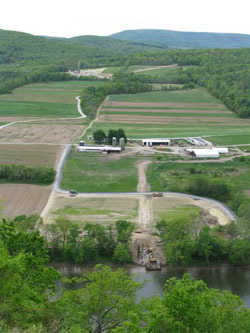 Since one of EDN’s primary funding sources, a grant program run by the Endless Mountains Heritage Region, was suspended for 2009-2010 due to the tightening of the state budget, members who had leased their own land suggested the Marcellus Shale boom that has swept the northern and western tiers of Pennsylvania as a potential source of money. Money raised from gas leasing will fund a laundry list of projects. The double-wide trailer that came with EDN’s 14 acres located across Route 6 from Prayer Rocks slid off its foundation one winter and is no longer usable as a meeting space. EDN maintains and uses a sweat lodge on the property, but EDN does not currently own a building that is suitable for council meetings. EDN members aspire to build a cultural center, which will include a museum and space for council meetings, Indian socials, and educational and cultural events. EDN leaders do not know how long it will take for the organization to raise the funds needed for the cultural center and associated costs, but in the meantime the community’s Eastern Delaware Nations, Inc., is negotiating $45,000 of lease money to purchase the former Grange building in Wilmot Township as a temporary gathering space. Among the costs associated with the project is the installation of a new driveway to access the property from Route 6. Meanwhile at the Rocks, one contractor asked for $100,000 to replace the narrow, forbiddingly steep path, which members must use when they participate in sweat lodges, vision quests, and other events. At the time of that estimate, EDN had less than $50,000 in the bank. In early 2010, when Mollie Eliot received a letter from Chesapeake in the mail expressing interest in EDN’s property, she called the chiefs and clan mothers to propose that a Chesapeake representative speak at the next council meeting in March. When Eliot spoke to the Chesapeake representative prior to the March meeting, she said, she told him, “You have to understand. This could take months, or even a couple of years.” But after the Chesapeake representative spoke to EDN’s leadership and members, and after he indicated that they could get their lease written to protect the surface of their land, the process was strikingly speedy. A motion was made for formal discussion. The group talked briefly. The leadership called for a vote. That vote was unanimous, except for two abstentions. But one of the clan mothers, a founding member, was missing.